Modernize your Application with AI and create a website in the programming language of your choice and host it through Microsoft Azure. 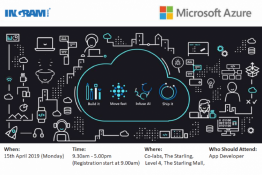 Ingram Micro would cordially like to invite you to gain insight on how to Modernize your Application with AI and Create a website in the programming language of your choice and host it on Azure. You will learn about the best practices to help you con­fidently build and deploy. You will also be able to provide direct feedback to our professional speakers.